Believing until his final breath! Trey’s lab work came back and his white blood cell count came down from 8,000 to 2,000, and his lymphocyte count came down from 85 to 4. These are both very good things. It shows us that the Campath did have some positive effect…which was a welcomed sight. The Campath did make his skin a little more red, which is frustrating, but we are continuing with photopheresis today and tomorrow and will see if this process somehow helps. We are praying it doesn’t enflame his skin more. Trey is scheduled to receive more Campath on Friday. After yesterday’s very difficult decisions and conversations, Emily and are feeling like we made the right decisions and are now waiting to see what comes from the medicines and treatments. We are just grateful Trey is still with us. We are savoring every moment with him and will believe until his final breath that our God is fully able to heal. Please continue praying. I believe God is hearing the cries of His people and showing tremendous, undeserved mercy to us. I’ll will update again if something changes. Thanks, more than we can say, for praying with us. Well…Trey pretty much sailed through the Campath. He is almost done. He did have a very mild reaction, which was what we wanted. The real test will be to see what the blood work reveals tomorrow. If his white blood cell count and lymphocyte counts are high, we will know the Campath had little impact…if they are lower, we will know it at least worked a little. We will also see what this does to his skin…which we hope helps. If the blood work reveals no impact, it will either be because the bad cells have figured out the Campath and are resistant to it, or we didn’t give enough Campath this time. We gave a VERY small amount today since Trey has not it in over a month. So, we will just have to wait and see what happens through the night and tomorrow. Emily and I were on our knees the entire time just praying that the Campath would work wonders this time…and that healing was flowing through Trey’s body. We will update more tomorrow once we get the blood work back and see the doctor. I am overwhelmed by how many people are praying with us in this journey. I simply cannot say thank you enough. Today was a very emotional day, but the Lord has been here with us in a powerful way. The next few days will be of utmost importance in Trey’s life. God is holding him and has a plan…I still believe his best days are ahead of him. Without question, where Emily and I are now, is the hardest place we’ve been yet. I am not going to go into all the details, but want to clearly express the seriousness of where Trey is. Even though there are signs that Trey is moderately improving (skin looking better, lungs responding well, etc. ), the bad cells in Trey’s body are rampant. His body is bearing a heavy burden regarding this disease. Because of this, we are at a significant crossroads. How far do we go? What drugs/treatment do we use? Etc… Every drug and every treatment at this point carries significant risks…risks that absolutely could be fatal. Emily and I want to use whatever we possibly can that will help Trey and give him the best chance to survive, but we also do not want to use anything unnecessary…and for that we need tremendous wisdom. We have decided to use Campath again today…but even this carries more risks than ever before because there are a lot more bad cells in Trey’s blood than ever before. We do need the Campath to provoke a response, just not too violent of one. Again, this is a very delicate and specific place to be. If the Campath does not work, there are other things we can do, but we are not sure we want to go down those paths…and we only will if we are sure they give Trey a chance to beat this disease. If they do not, we will be left without options and will then be in a place of keeping Trey comfortable until the Lord calls him home. So, that’s where we are. We are still holding out hope and will hold out hope until his final breath for the Lord to intervene and heal Trey. With God all things are possible! But, as I said in an earlier post today…BUT IF NOT…we will know God was finished with Trey on earth and wanted him to be with Him forever in heaven. So…please pray! We are asking for a miracle and for lots of extra mercy and wisdom. Our God is in control and He is holding Trey!!! Trey’s lungs have responded nicely to treatment. That is a huge praise the Lord. He is still on a high pressured oxygen machine called a Vapotherm, but they continue to bring his support level down and he is breathing at 99-100% saturation. That is very good!!! Because he’s been doing so well, he was able to move out of the PICU and back into his room today. That was a huge lift to his morale and psyche. We are so grateful to be back in his room. So, tomorrow is a big day though. We are going to begin trying Campath again. It has been 4 weeks since he last received Campath. When we used the Campath, it did an excellent job controlling the amount of bad cells in the blood, but seemed to be an aggravate to his skin. However, he still had his spleen at that time and we don’t really know if the skin problems were a result of the Campath or if they would have happened any way. Currently, his skin looks better than it has in weeks!!! We give God great glory for this!!! But we are naturally concerned the Campath might aggravate his skin again. But we have to try it because it does such a good job keeping the cells suppressed in the blood. So, we will start with a small does tomorrow and see how he responds. Please pray he handles this well. Please pray his lungs endure. Please pray his blood pressure stays strong. Please pray the Campath will actually help and not hurt his skin. Please pray the Campath works!!! We will update everyone tomorrow. Oh Lord heal…that is our prayer!!! Trey has had some issues lately. When we brought him back to Dallas on Thursday, he began having fever and lots of stomach issues. Yesterday, he really started battling some oxygen and lung issues. Last night, he was really struggling, especially when he would take his oxygen mask off…he was dropping in saturation very quickly. As a precaution and to avoid an emergency type situation, our doctor had him moved to the PICU. Trey has some fluid in his lungs. We don’t know why this has developed. It could be due to an infection, it could be a result of some of the meds he’s been on, it could be that the bad cells have found their way into his lungs, or it could be something else. We just don’t know. Right now, our doctors are working hard to keep the lungs open and get the fluid out. 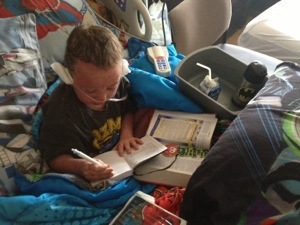 Trey is getting numerous breathing treatments and receiving lots of meds to help. It is critical that we get this under control. His body could not handle a major infection right now. I will say this though, if the bad cells, which we know have increased, have found their way into Trey’s lungs, we will be facing a very difficult situation. Treatment options will be very limited. All I know to do is to ask the Lord for mercy and extended grace. We are very desperate for His help right now and have truly begun praying for Him to act quickly. These next couple of days will be very important for Trey. 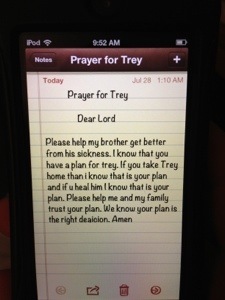 I know we ask a lot, but please rally prayer for Trey from whomever you can. We’ve never been more in need. Thank you.